Laurie is a friend I met through HGTV's Rate My Space. She lives with her husband and children on a horse farm in California, in a beautiful farmhouse they built themselves. Her decorating has been an ongoing process. 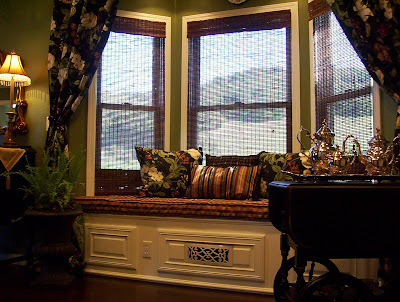 Over the past year, she has sewn curtains and arranged accessories; her husband has built window seats and hung molding. 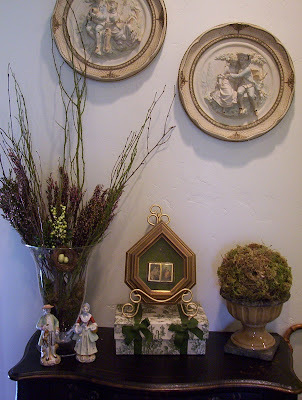 When I asked for some pictures of her favorite decorating details, Laurie was kind enough to send me these. I know you will enjoy them as much as I have. 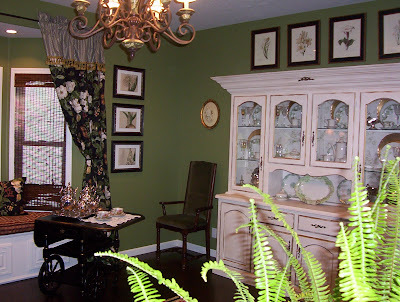 Laurie painted the hutch and sewed the curtains. The three stacked botanical prints are 200 years old. Laurie and her husband built the window bench themselves. 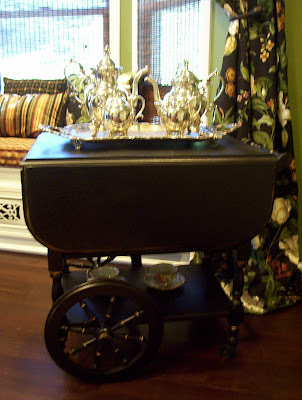 The tea cart below belonged to Laurie's mother and the tea set to her grandmother. 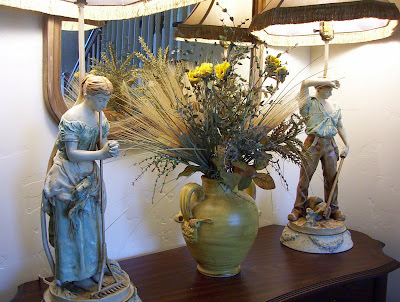 Laurie's favorite French peasant lamps. In case of emergency, she says she would save these first, after her kids, of course! The chalkware plaques belonged to Laurie's great grandmother. 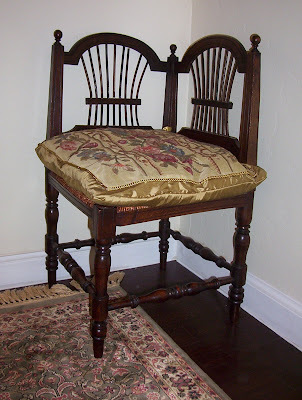 A kid's corner chair from the early 1900's. Laurie's screen name on RMS is DecoratingFanatic2. You can find her RMS pages here. 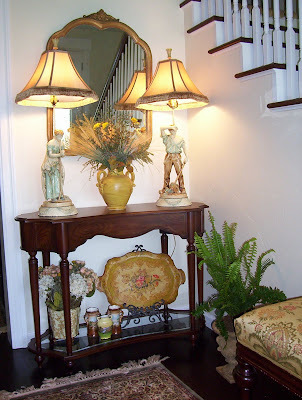 I was overwhelmed with your responses to my request for pictures of your decorating details. Thank you so much for sharing them all. Make sure you stop by tomorrow, so you can see all the beautiful details! What a lovely space in CA! One talented lady! Your friend Laurie's home is beautiful. All the heirloom pieces are stunning. Thank you for sharing the pictures with us. Thank you for sharing her pics with us! Her home is absolutely gorgeous! Love all the special touches and details.. Thank you! Can't wait to se tomorrow! What a lovely home & talent your friend has! Lovely pix; I have admired her house on RMS. What a fun thing you are doing Mary; I wanted to participate, but you know I am "California Dreaming" right now and must get prepared for my trip to LA LA LAND!! Laurie has a beautiful home! 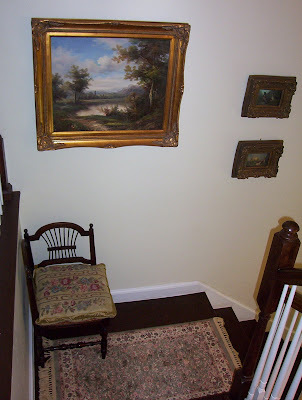 The very first thing I noticed were the double paintings hung over the fireplace...really nice! Plus I love red and yellow combinations. There's just too much to comment on...congrats to Laurie! Love her house...so pretty. I noticed the rooster lamp right off seeing how I love em !! Thank you and Laurie for the tour...I would love to see more of her pretty home. Laurie's home is beautiful! Love her colors and the way she decorates. I always enjoyed looking at her home on RMS but this is even better! 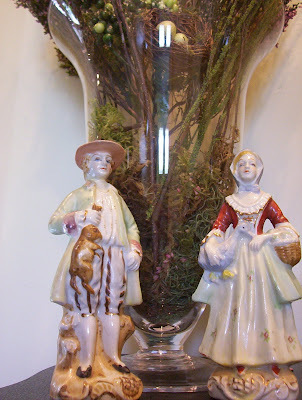 Hi, Mary, I was going to send in some pics, but I ran out of town with traveling & catching up. 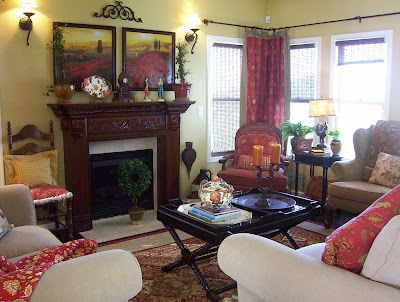 Love Laurie's home, what a lovely job she did with decorating. 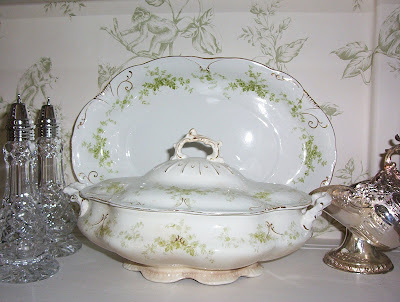 So homey & cozy and I love all the family pieces too. Wow, what a beautiful home. It makes me want to strip mine down to bare wall/bare floor and start over. I have such a mix of stuff here that just doesn't quite pull together. Wow. Awesome. Loved that living room. That is so beautiful and so inviting. I need her as a decorator and I "rate her space" as a 10. 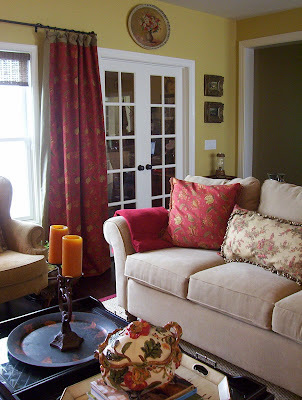 I have that same sofa, and I love the way she changed out the matching pillows it came with for patterned ones. I'm going to try that! I know her home very well from stalking her over at RMS. (lol) She is such a sweet lady and she has one of the most beautiful homes I've ever seen. Thank you for sharing it here too. Beautiful home... thanks for sharing. I enjoyed seeing her pictures! What a beautiful home and I love that she and her husband made things for it. Those curtains in the dining room are just gorgeous. 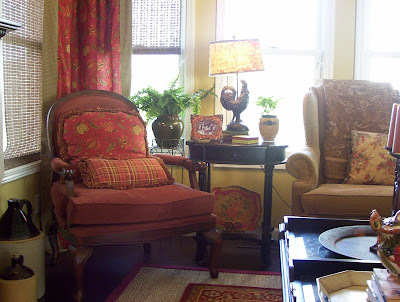 Love that monkey toile she used!! What a lovely home....decorated over time....love that!! This virtual house tour is FUN! Thanks Mary! :-) I'll tune in again tomorrow for more. WOW! What a gorgeous house! Makes me completely inadequate in the decorating dept. Now, if this is a horse farm - is there a mud room?